Additional Info: Finland is known for its peacefulness and beautiful nature. Large forests, a unique archipelago and thousands of lakes present a striking mixture of wooded hills and waters. Finland is a country of thousands of lakes and islands; 187,888 lakes (larger than 500 sq. miles) and 179,584 islands to be precise. One of these lakes, Saimaa, is the fifth largest in Europe. The Finnish landscape is mostly flat with few hills and its highest point, the Halti at 1,324m (4,345ft), is found in the extreme north of Lapland at the border between Finland and Norway. Finland is one of the few countries in the world whose surface area is still growing. Owing to the post-glacial rebound that has been taking place since the last ice age; the surface area of the country is growing by about 2.7 square miles a year. Some areas of Finland are designated as hiking areas, and options in these places vary in length and terrain, from nature trails of just a few miles in Evo in southern Finland to the 82-mile so-called Bear (Karhu) Trail in the north-west. Nilsia (located in the province of Eastern Finland and is part of the Northern Savonia region) and the three hills of Tahko are very famous for their awe-inspiring landscape and great opportunities for summer activities. There are plenty of hiking trails in peaceful nature amidst changing scenery. Climb to the peak and enjoy the beautiful view from the top of Tahko, a 6-mile hike, which is quite easy. Follow a trail up the hill to the top of Tahko, a 100m (330ft) high hill surrounded by forests and fields. Stop on the way up and enjoy the great panoramic views over lake Syvari and the 3 hills in the area. The hike continues along the ridge of the hill, passing a frog pond on the way before reaching the top of another hill. The views all around you are magnificent so take your time on the trail. Descending the hill side you will reach Lake Syvari and continue along the lake shore until you return to your starting point. The lake is part of the great Saimaa waterways famous for its canal network, numerous islands and picturesque small harbors. Evo is one of the largest continuous forested areas in the southern Finland. Inside the large hiking area, you can walk on marked trails and stay overnight in lean-to shelters and designated camping sites. The scenery is dominated by the esker formation in the middle of the area. On the edges, the terrain is more rocky and difficult. The differences in altitude can be as much as 80m (262ft). The Arctic Circle Hiking Area is a wilderness-like destination ideal for year-round outdoor recreation. It is located a half-hours car ride from the town of Rovaniemi. The landscape's signature features are the rugged hills, open water-logged aapa bogs and the River Raudanjoki with its spectacular rapids and lush shoreline forest. Rovaniemi is the administrative capital and the centre of commerce of Finland's northernmost Province, Lapland. 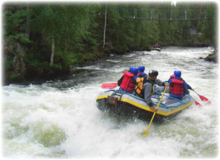 It is situated close to the Arctic Circle and between the hills of Ounasvaara and Korkalovaara, at the confluence of the Kemijoki River and its tributary, the Ounasjoki River. 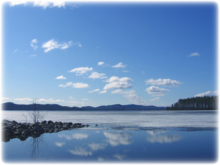 Inland Finland is divided into three main Lakeland waterways, which include several watercourses. The abundance of waterways and water routes in Finland is unique, and your choice varies from short, relaxing canoeing day trips to extended kayaking trips on open stretches of water. Routes are varied, mainly sheltered and suitable for both canoeing and kayaking. Canals and channels link many lakes. The Squirrel Route, a canoeing route of lakes, rapids and fast-flowing streams, consists of seven rapids, generous flora and varying landscape which provide you with an exciting and magnificent experience. The length of the whole route is 35 miles. This route is the first biologically researched water/aqua nature path in Finland. There are 21 nature information boards along the route, where you will find helpful information about plants, animals and environmental influences about the surrounding area. To paddle all 35 miles, allow 2-3 days; spend nights camping by tent or in the cabins on the route. For a one-day canoeing trip, head to the River Oulankajoki (northeast of Kuusamo, in the northern Ostrobothnia region of Finland), which flows into the White Sea through deep valleys gouged out by the river in the middle of the versatile wilderness area. A canoeing trip on this river lasts about 7 hours and can be taken without a guide. Rental equipment and travel to/from canoe sites cost about 25 Euros. 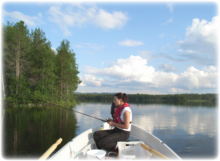 The various waterways of Finland, teeming with fish, provide a fabulous variety of fishing opportunities. The diversity of fishing sites is perhaps the greatest attraction for anglers. You can enjoy wondrous lakes as well as rivers and rapids coursing through the vast forests. You can even fish in the winter: ice fishing through holes in the frozen lakes and sea is an ancient but still very popular Finnish tradition. 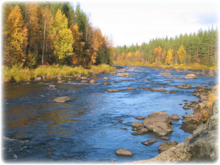 Salmon fishing: Fly fishing for salmon means the River Teno for most Finnish anglers. Tena River, is a 330 km (205 mile) long river in Lapland, in the Norwegian county of in Finnmark and the Lapland Province of Finland. It is well known for its excellent salmon fishery and is the most productive salmon river in Norway. The world's record for Atlantic salmon is held by a salmon caught on the Teno; it was 36 kilograms and was taken in 1929 by the late Nils Mathis Walle. Best time to try the fly here is July wither from bank or boat or by donning the waders and heading in. In September or October, try the Kymi River and neighboring coast, you might also catch a pike or trout. Sea fishing on the wide archipelago of the Gulf of Finland with its dazzling seascape creates magnificent surroundings for the day's fishing experiences. Try fishing in the Gulf of Finland around Helsinki where catches can vary according to the season; from scaly perches to superior pikes, delicious pikeperch and challenging trout. Ice fishing, the activity of catching fish with lines and hooks or spears through an opening in the ice on a frozen body of water, is a popular pastime in Finland. Solitary and contemplative isolation is often the object of the pastime. In Finland, fishhouses are a rare occurrence, but wearing a sealed and insulated drysuit designed out of space-age fabric technology for emergency rescue teams is not. Guided fishing excursions are available, where you will be provided with the proper gear and clothing. On some excursions you'll be able to cook what you catch.